Located beside the river, across from the Western Academy of Beijing, Filling Station is an American classic with a touch of modern interiors. This funky diner gets bonus points for promptly serving jumbo glasses of ice water to patrons without prompting – a refreshing rarity for Beijing restaurants. The adult menu features a selection of burgers (RMB 58-98) that include a side of fries dusted with chilli pepper and a range of hotdogs (RMB 38-58). The ample kids menu features Sausage Spiders (hot dog sausages with spaghetti legs (RMB 35) and Easy Peasy Mac ‘n Cheese (RMB 35). 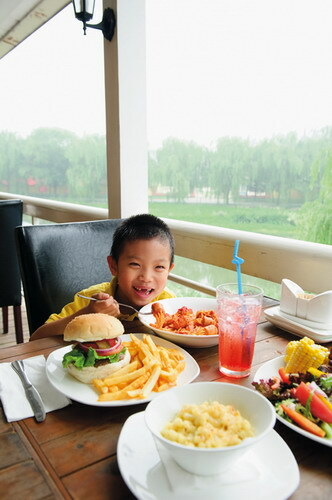 Other offbeat selections designed especially for kids are banana pancakes (RMB 35) and mocktails (RMB 20). When hungry bellies are full, the playroom awaits – with slides, a selection of retro video games and a foosball table. With delectable meals for both adults and children alike and fun games to boot, the Filling Station is a great place for a family meal or lazy afternoon lunch.